click here for your 1 month free trial! 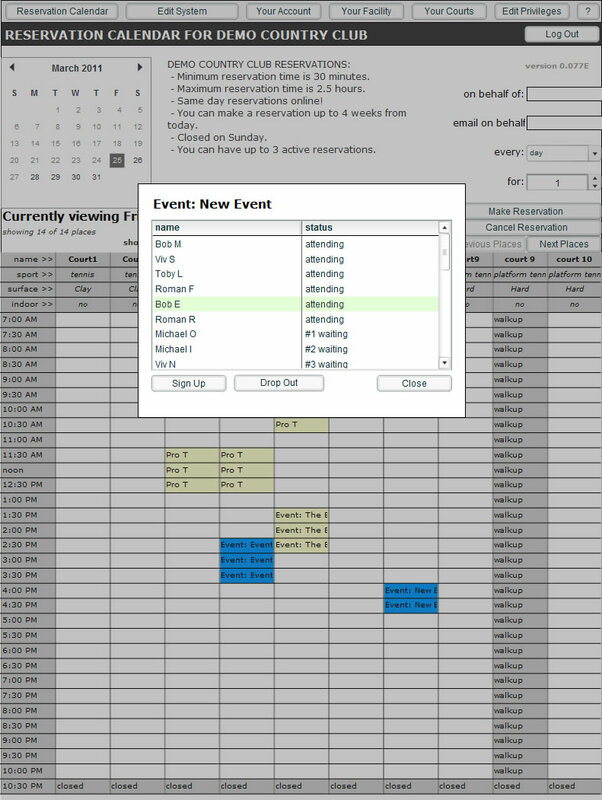 If you are using lessons, you can now set up pro schedules with the hours and days they're working. If a pro isn't working, then they can't be booked for a lesson. When a pro is booked once for a period of time, he or she can't be double booked for the same time. Tired of getting calls about who's signed up an event? 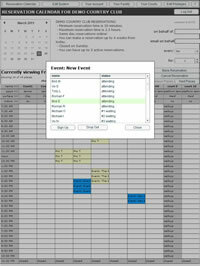 With MyReserver's easy to use event system, you can quickly setup an event. Players will sign up and or drop out of events. Players can also see who else has signed up and if too many members have signed up for an event, they are put on a waiting list, just incase someone drops out of the event. Shy members can also hide their name with the clifk of a button. There was always a ban feature, but now there is an auto ban feature that is used with the new misuse and no show functions. Your pros or admins mark members that have no showed or misused the system. Once they go over the number that YOU set, they are auto banned. There is also a way to suspend a member instead of just banning them. You simply set how many days they are to be suspended and the system keeps track of things. If you change your mind, you can remove the suspension as well. There was always the ability to make reservations on behalf of a player, but now there is the specific ability to make a lesson. For admins, they will pick the pro and type in the student name or pick from a drop down box. Pros have the same ability, but they don't pick a pro. As a pro or admin, you can make notes for any reservation. You can have any information you want in here. Is the player getting better, worse, what to work on next. Only the pro that makes the reservation or an admin can view or edit the note. Just for pros, they can easily print their week long schedule. It will show who they will instruct, what time and what day. Click here here for an example. Admins can also print pro's schedules for the week by selecting the pro. To make things easier for your pros and admins, the privileges section has been revamped. 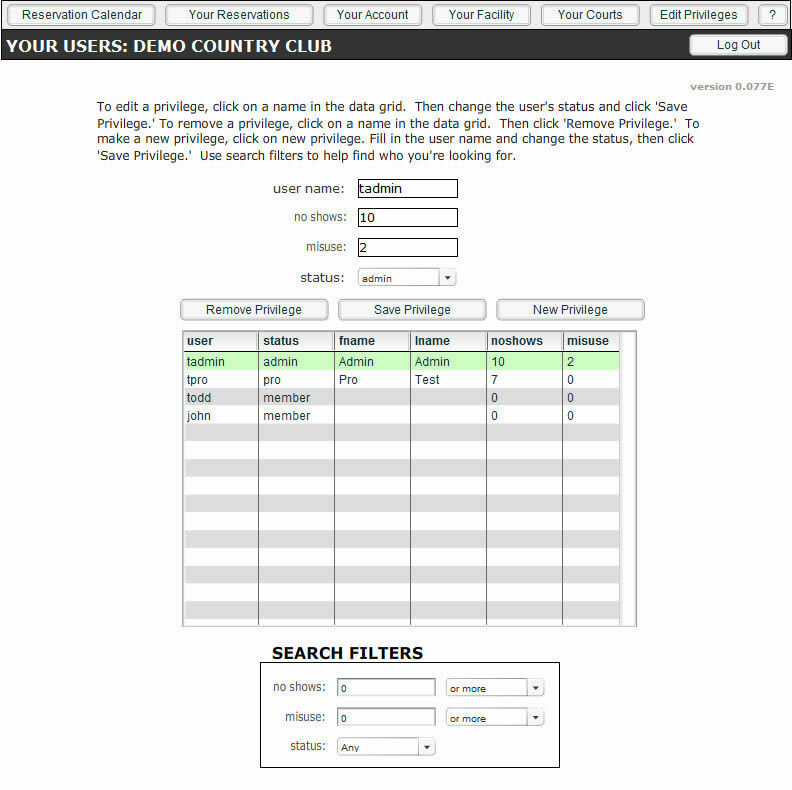 There are search filters for privilege types, misuses and no shows. The process of adding new privileges and editing privileges has been streamlined as well. April: V 0.87: Pro schedules are now in the privileges section. They are used to block out lessons from being made with a pro that isn't scheduled to work. April: V 0.87: Lessons with a pro cannot be double booked now. One time per pro. April: V 0.86: Note Box for reservation now works when an admin or pro hovers over a reservation. April: V 0.86: Admins now see default colors for reservations instead of their own color. April: V 0.85: When making a lesson, full names of pros and members now appear when selecting them. Making searches easier. April: V 0.85: Admins can now pro print a weekly schedule on behalf of a pro by picking one of their pros. April: V 0.85: Members can now cancel their lessons. April: V 0.85: Lessons now count as a reservation if there is an active reservation limitation. April: V 0.85: More visual touches for how lessons appear on the grid for the player they're reserved for. April: V 0.85: Member Request system fixed. April: V 0.84: Pros & Admins can make reservations over closed & walkups. April: V 0.84: Improved make a lesson. April: V 0.83: Fixed a few small errors with drop down boxes. April: V 0.82: Fixed a privilege loading error. April: V 0.81: Advanced searches for admins through user databases. More optional information for users. April: V 0.81: If all courts have the same surface, sport or indoor area, those that are the same will not appear. Same for the print function. April: V 0.81: Numeric Steppers in the privileges section. March: V 0.80: Event notes / descriptions are now available and editable. Only admins can make events now. Admins can drop out players from the attendees list of an event. March: V 0.79: There are now reservation notes that can only be seen, made and edited by pros and admins. March: V 0.79: Events are now easier to make. March: V 0.78: Events added. Facilities can add events, players can sign up, drop out and see who's participating. March: V 0.78: Pro Print that will print a week long schedule for a pro. March: V 0.78: Revamped edit privilege section with search filters and an easier interface. March: V 0.78: Stats for misuses and no shows have been added along with auto ban features. January: V 0.77: Pros & Admins can now make permanent reservations along with consecutive reservations. January: V 0.77: Pros & Admins can now assign colors to reservations they make on behalf of a player. January: V 0.76: Fixed parsing error with google maps in email confirmations and reminders. January: V 0.75: Small error when reserving just before a reservation. January: V 0.74: Courts can now be opened or closed independently from when the facility opens or closes. January: V 0.74: Courts can now have specific permissions who can make a reservation. January: V 0.74: Pros & Admins are no longer restricted by minimum & maximum times.